Cleared Ocotal with 5 marines and 5 guardia; also Mr. Albir, Honduranian Consul and Alcalde of Ocotal. Patrol proceeded through Dipilto to Las Manos which is in Honduras. Found all houses between Ocotal and the Honduras border deserted with the exception of two. These were at a place called San Jose. At one house there was a woman and two children. She said her husband had gone to Ocotal to purchase supplies. One of our mules was unable to proceed further and it was left in her care. She offered us a horse for our use which was accepted. She informed us that a house, which could be seen farther up the mountain, was occupied by bandits. We saw two men run from this house and it was deserted when we reached it. Mr. Albir's house, which is about five miles north of Dipilto, has been burned within the past two weeks. Dipilto is a town of about 35 houses and, from all appearances, has not been occupied for several months. For many miles between Dipilto and Honduras both sides of the trail and practically all of the ravines are covered with coffee trees. There are, also, many head of cattle in this area with apparently no owners. At Las Manos, which is just across the border in Honduras, we found 15 or 18 men all armed with revolvers. They seemed to be very much perturbed by our presence. They said we were the first Americans they had ever seen. Three of them requested permission to come to Ocotal, enroute to Esteli, under arms. When refused this they left their arms at Las Manos and followed us to Ocotal. On our return trip we traversed a different trail. We circled about fifteen square miles without seeing any activity of any nature. It is believed that if there are any bandit gangs operating in this territory of more than two or three men they must come across the border from Honduras. • Report used to open my "Sandino Rebellion Revisited" chapter in the Duke volume (1998): these four groups of actors & the manner of their interactions used as allegories for the four major social processes transforming Nicaragua during this period: the US Marines (imperialist intervention); the Guardia Nacional (state formation); the "bandits" they stumbled into (continuing civil war between Liberals & Conservatives); and the EDSN (popular nationalism; the episode's invisible presence and why Marines were mucking around in Las Segovias to begin with). • Woman warns patrol & lends them her horse (fluidity of identities and allegiances). • Mr. Albir's straddling of national boundaries (ambiguities of identities in the borderlands). • Burning of Mr. Albir's house (continuing violence & property destruction after the Civil War). • Coffee trees and roaming cattle (emergent capitalist economy meshed with older pre-capitalist one). • Postscript: According to Jinotega historian & folklorist Eddy Kühl, USMC Lieutnant D. Earl Wells later married Jinotega native Anita Möller, daughter of German-born merchant Paul Möller. Anita Möller-Wells died around 2008; D. Earl Wells died many years before. They had three children: Freddy, Harvey and Yves Wells Möller. The photo to the right is of Harvey Wells Möller, historian, author, linguist, and "one of the finest and most cultivated people of Jinotega's latest decades," in the words of Jinotega native E. Arturo Castro-Frenzel. As of August 2012, Freddy and Yves were still alive, Freddy living in Matagalpa and Yves in Jinotega. 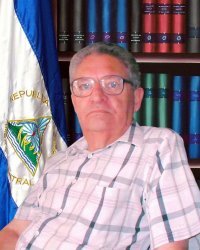 An obituary of Harvey Wells was published in Nuevo Diario in 2009: http://archivo.elnuevodiario.com.ni/2009/03/28/nacionales/98533. I thank E. Arturo Castro-Frenzel for this information.